This is not exactly how I envisioned this would go, but it is a sampler! I may alienate many people with this statement, but I have to take the risk: I don’t like butterflies. I used to like spiders because of the Greek mythology connection and because they eat other insects. But then I found out that they are cannibals. Now, I must simply say that while I respect the place of insects in Nature, on the whole I simply am not interested in sharing space with any of them, no matter how delightful the coloring. Butterflies are too much like moths. Bottom line they are creepy, crawly, wormy things before they mature. I’m really more of a flora than a fauna person!Consequently, I was not thrilled with the idea of a stitch that is called Butterfly Chain. But as I have committed to this year-long challenge offered by Sharon Boggon at Pin Tangle, this “little” thing called Take a Stitch Tuesday, I must tackle this stitch. BUT, I have a re-frame, good little strategic therapist that I am! My little chains are not creating the lovely body of butterflies out of my straight stitches, they are instead gathering together stalks of corn or wheat or some other grain that looks like liquid gold in a field!Ahhh, relief. Now I can stitch! I didn’t start with a sketch this time. I just kind of had an idea in my head. It’s better to start with a sketch as it’s much easier to erase on paper than it is on fine, 32 count linen! (That’s what my 2012 TAST Sampler is stitched on.) The following slide show reveals the evolution of what I’m calling Wisteria Fence. You’ll see why as the pics progress. The Bullion Stitch, Not To Be Confused With Bouillion Cubes! I have to wonder if I have ESP. Last week when I posted about French Knots, I mentioned I much prefer the Bullion Knot or Bullion Stitch. And what do we have for this week’s TAST Challenge?! Yup…The Bullion Stitch. I decided to make a spray of wisteria on my Sampler. The Bullion Knot is perfect for such drapey flowers. I’d be interested to hear from you what other flowers this stitch would be good for. 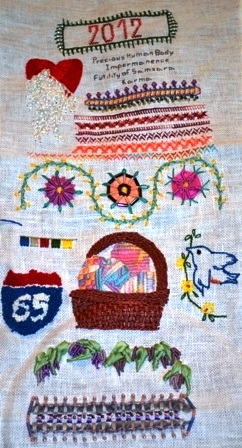 It was interesting to look at the different tutorials available for this stitch. 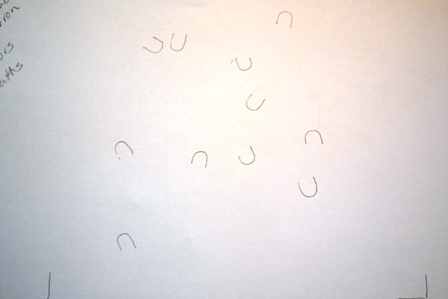 Using my own Stitch Diagram reference page, I found Sarah’s tutorial to be most useful to me. I really needed a refresher, too! 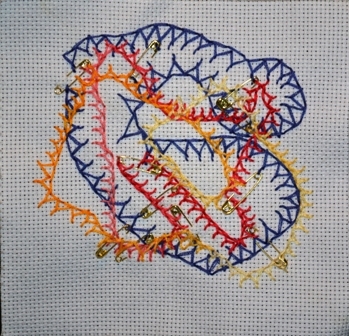 The last time I did bullion stitches was in (about) 1996 when I was determined to learn ribbon embroidery while I recuperated from surgery. People either love or hate bullions, but most of the problems associated with working them is that people use the wrong needle. She’s so right! This is important because not only does the needle have to go through the thread you wrap or coil around the needle, but you also need to drag the doubled thread through the coiled thread, too. I did not have the perfect needles on hand for this, so I tried to compensate by allowing the coils to relax as I wiggled the needle and thread through the coil. I think that may have given me my little problem of the bottom-most coil being a tad loose. I used three types of thread to work my bullions—a silk ribbon (the green), a rayon loosely woven ribbon (the darker purple on the left), and DMC #5 Perle Cotton (the light purple on the left and all purples on the right.) It was definitely easier making the bullions with the cotton Perle. 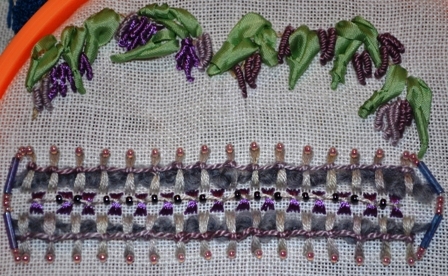 The leaf on the right is a fair example of the Chain Stitch with ending done in Bullion Stitch. The Silk on the left leaf was somewhat twisted while wrapping the needle. There are actually three stitches in my sample. First, I made a “branch” with stem stitch using two plies of cotton floss. 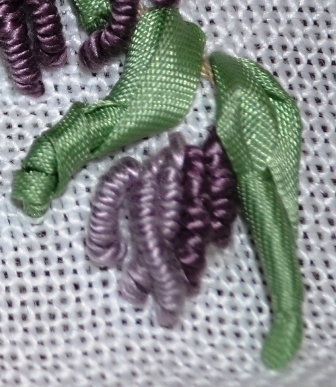 Then there are the bullion wisteria flowers that I made with the Perle cotton and the rayon silk. The green leaves are a composite stitch made up of a chain stitch where the anchoring final stitch is completed as a bullion stitch. It gives a nice shape to the leaves, I think. What do you think? Come on Don’t be shy! I can take it! I looked many places to find tutorials on the Half Chevron Stitch. It is not a well documented stitch. If anyone has any info on how this stitch was developed I would love to know about it. I did, however, see numerous blog posts about the half chevron. Most were in reference to the TAST challenges. Interesting. My approach to this stitch was to consider additional “notions of attachment.” One person has commented on my play on words. I’m not sure others understand the intended stitching pun! I’m sure all stitchers understand sewing notions and things we use for attaching to fabric. But I was also alluding to notions meaning ideas and the attachments I meant were the attachments that impede spiritual progress in Buddhism where attachments are considered the root of all suffering in life. For years, indeed decades, stitching has been a meditation for me. It began when the only stitching I did was counted cross stitch. I came to see that each stitch was the equivalent of one breath. One half the cross is a breath in. Completing the cross is the exhalation. Maneuvering the thread and positioning of the hand and work is the space between breaths. And in this way, each embroidered piece is ALIVE! Then when you give that piece away, you are giving a very real part of your essence. Part of traveling a Buddhist path is to look carefully for any impediments along the way to reducing suffering in the world and ultimately reaching a state of enlightenment. There are so many ways of accomplishing this. One of the things that is a chronic problem for me on the path is attachments, things that keep me stuck in one place, things that make me feel too strongly in one direction. I have been successful to a large extent in giving up my emotional attachments to “things.” For example, when the box holding my bone china collection fell in the storage unit last summer, Jeff apologized for a week as he had heard the tinkle of breakage when he grabbed the box. I had a moment of profound sadness. But only a moment. I felt the feeling and then it was over. Jeff was more upset than I was. This summer we will open that box and toss out what is pointless to hang on to as we continue to downsize. It will be work. It will be a job. That’s all. No drama. When traveling North and I thought that we were going to lose our truck and our lifestyle. I was devastated. Primarily thinking about the possibility of moving into a situation that would not allow me to keep my dogs. I am INCREDIBLY attached to my dogs. It is an extreme emotional response. 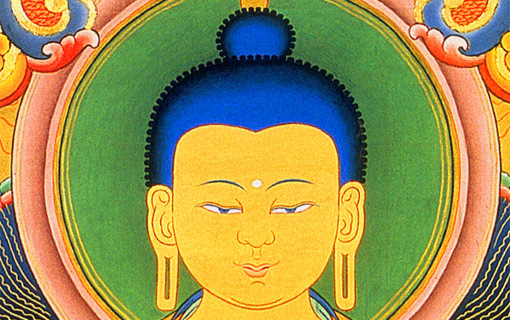 This is an Attachment that stands between me a living a life of Nonattachment according to Buddhist principles. It is something I struggle with every day. Hence my TAST 2012 Attachment Quilt block that I have named Pinned, like pinned to the wall, pinned down. I began with the notion (and the idea). Would it be snaps or pins? 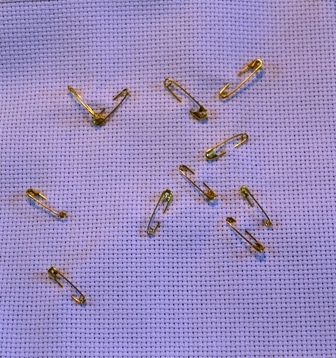 With the half chevron stitch I decided safety pins would be the better choice. After all the chevrons are spikey like the pins. I tossed the pins and let them sit where they landed on my sketch pad within the six-inch square. I traced the heads of the pins to capture the orientation. Okay, now what?! Color. I decided to go with some approximation of primary colors since the attachments I have been meditating on are very basic, primal if you will. Each of the three colors would follow a different path and end up where it began, the danger of all unexamined attachments. See how messy it can get! And those half chevrons, they look so prickly. Does any of this make sense to you? Does it resonate with your connection to stitching? 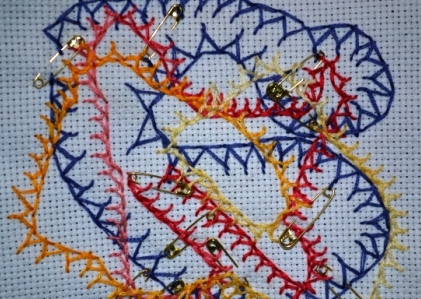 Does stitching help you think or problem solve? Or pray? A couple of weeks ago I wrote about our dreadful experience of traveling North from Alabama this spring. That post was about where I ended up from a stitching/TAST perspective. Just a reminder, TAST is Take a Stitch Tuesday, a weekly stitching challenge sponsored by Sharon Boggon of Pin Tangle. 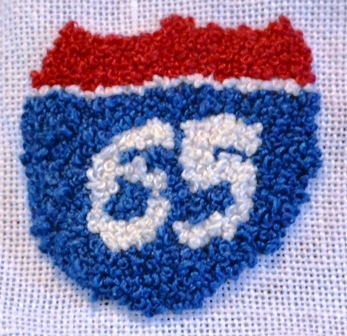 While we were on the road the stitch challenge was French Knots. Thank goodness we didn’t drive the whole of I-65! I find french knots tedious. I know how to do them. I think I’ve stitched a million in my lifetime. I prefer bullion knots. They are less tedious and more interesting to look at. Nothing was more tedious than driving on Interstate 65 this spring. We picked it up in just north of Mobile, Alabama, followed it through all of Tennessee, and up to Louisville, Kentucky. I have spent way too many nights stitching the tedious french knot into a sign all too (unfortunately) familiar to me. Now I-65 is out of my system. Well, mostly! If you are like me, you talk to the TV, to the dogs (and for the dogs), to the clock, and all kinds of things that don’t have conversational skills or abilities. I also make up silly songs to familiar tunes. When I sing the dogs think I’m happy and it’s time to play. Lately, I talk to our truck, offering her compliments and encouragement during our very short and focused trips to the grocers, vet, and laundry. We are still waiting for our new engine to arrive. I decided our truck, affectionately called Betsy (after Davy Crocket’s rifle—ask Jeff, that’s on him! ), but also known as “The Beast,” needed her own song. After all, I have songs for both of the dogs. I’ll post them if you ask!) Following is the song Jeff and I came up with in honor of Betsy. Make sure you’re alone, then sing it loud and sing it proud! Betsy….Betsy, The Beast, Queen of the Interstate! Lost the piston lobe on cylinder eight. For twelve hundred miles she gave it her all. Almost to the top, she collapsed with a sigh. Till they went looking down at the new truck store. Then The Beast will haul again, almost good as new. Button, Button: What do you think of my crossed buttonhole stitch? Not sure what the final orientation will be, but I kind of like this. The TAST 2012 Quilt Continues! This time my six inch square is covered with crossed buttonhole stitch. And what goes better with any buttonhole stitch but buttons. That’s where I started. Given the stitch, the attachment was given. Even though the vintage or old buttons I’ve brought with me reflects only a small amount of my button collection, there are still a huge number of choices to consider. Off to the sketch pad. Given the sketch, I knew I needed a variety of button sizes to provide movement and interest. Keeping the buttons within a color family is also necessary so there are not too many variables to grab the eye. I want the buttons to enhance the stitching not compete for top billing. After trying several possible colors, I found my selection of red buttons gave the effect I was looking for. On to the next variable—threads. I played around with some threads in colors complementary to the buttons. Again, it felt like there was a competition going on between stitch and buttons. Okay, monochrome it is! But that doesn’t mean the threads can’t sing a bit on their own. I chose different textured cottons. And then I played around with numbers of plies of the cotton. Thus the variability and color intensity of the buttons is reflected in the threads. As for the stitch, I have not done this stitch before, so I had to practice a bit as my brain worked to cross sides as effectively as the threads! I used a DMC #5 Perle Cotton scrap from my stash. I also decided upon DMC variegated cotton floss #115. I love Caron threads and chose a stranded pima cotton (Watercolours) called appropriately Flame. Another of my favorite threads is Weeks Dye Works. Don’t you love the color name? Louisiana Hot Sauce! I would have to say of the variations in the crossed buttonhole stitch that I tried, the one that looks like cross stitches with bars was the trickiest. Not sure why. Maybe more practice will answer that question. 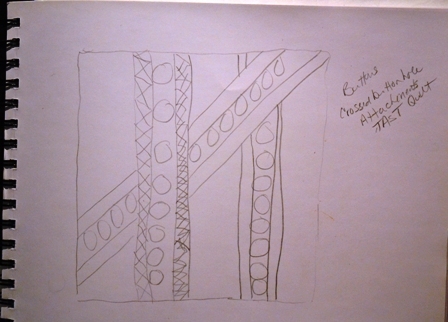 I have presented photos of different orientations of the block in my photo album at Stitchin’ Fingers. What do you think? Like the block? What variation did you try? Like best? Are you loving TAST 2012? What do yo think the next stitch will be?